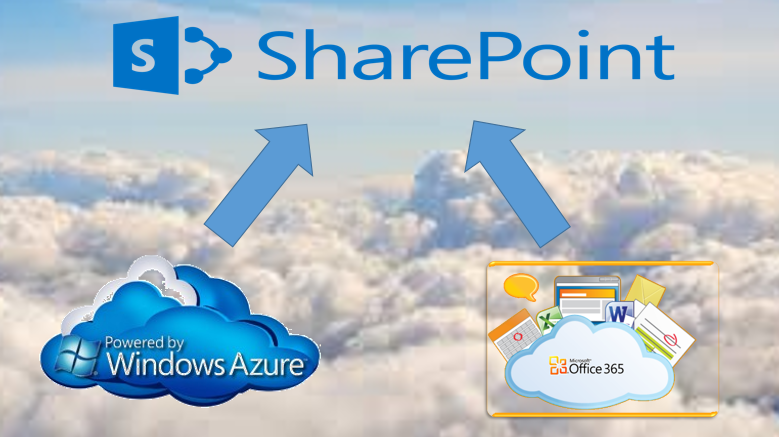 Nowadays when we go to a client or a fellow developing Sharepoint and we talk about Microsoft Sharepoint on the cloud a doubt always arise “are we talking about a Virtual machine on the cloud or Office 365? “. In the past 3 years had been almost a war to justified to clients the options, especially with the push Microsoft had been making around Office 365. Today i’ had read a post from Chris McNulty that really summarizes what i had been writing saying and teaching about the theme (you can find the original post here http://www.cmswire.com/cms/information-management/sharepoint-in-the-clouds-choosing-between-office-365-or-azure-027187.php). We hope that this can help you to take the right decision and have a clear idea about the differences. All the credits off this post go to CMSWire and Chris McNulty. There are dozens of cloud hosting options for SharePoint, beyond Office 365. Amazon, Rackspace and Fpweb offer compelling alternatives to Microsoft’s public cloud for SharePoint online with a mix of capabilities. IaaS (Infrastructure as a service) — cloud hosted VMs on which YOU install Windows, SQL, SharePoint. For better or worse, you have complete control over administration and customization. SaaS (Software as a service) — fully managed solution delivering SharePoint services with full subscribed provider managed availability, backup, performance, installation, etc. For better or worse, you have limited control of administration and customization. Now, it’s debatable that Office 365 itself is a pure SaaS solution — you carry a lot of responsibility for managing your own security and content. Let’s suppose that Azure hosted virtual machines represent IaaS and Office 365 represents SaaS. You are comparatively free of the history and capabilities of many on-premises environments. As a result, you’re a strong candidate for Office 365. You will get immediate benefits from the platform services without needing to disrupt existing content patterns or internal processes. You have the classic posture of an on-premises environment. If you are trying to gain some of the advantages of the cloud, an IaaS solution like Azure VMs may be a stronger fit for your organization. Based on your use cases, a hybrid between O365 and Azure may also introduce some of the service simplicity of Office 365 with the complete admin control from Azure. On premises forever! You can work on other projects for the year while your needs progress and the solutions improve. Obviously, your use cases may vary significantly form those mentioned here. This is intended to help you access your success criteria relative to the business cases and economics. Best of luck with your cloud(s) evolution.